Vientiane (VNA) – The sixth East Asia Summit (EAS) Foreign Ministers’ Meeting was convened in Vientiane, Laos, on July 26 as part of the 49th ASEAN Foreign Ministers’ Meeting (AMM 49). 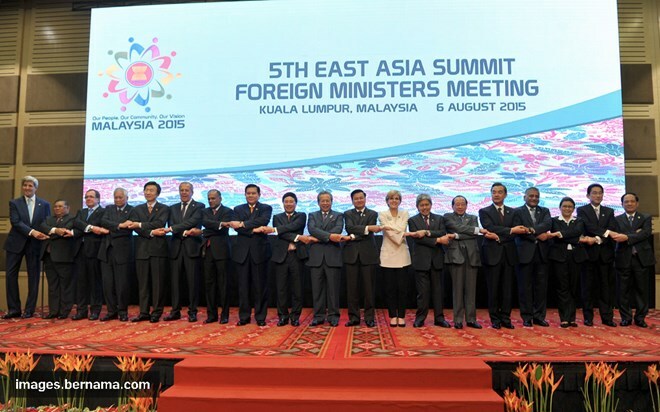 The ministers along with partners from China, the Republic of Korea, Japan, the US, India, Russia, Australia and New Zealand discussed the evolving regional architecture, the EAS’s role, and the implementation of the Declaration marking the EAS’s 10 th founding anniversary issued in Kuala Lumpur in November 2015. They highlighted the EAS’s remarkable progresses in prioritised fields such as energy, education, finance, global health, disaster and environment management, and ASEAN connectivity. The ministers called on the EAS member countries to continue executing the Plan of Action to Implement the Phnom Penh Declaration on the EAS Development Initiative in 2015-2017, while increasing cooperation to address challenges relating to regional peace, stability and security. They also emphasised EAS’s support for and contributions to increasing trust between countries in the region, anticipating regional developments, and maintaining and promoting peace, stability, security and prosperity in the region. The foreign ministers reaffirmed their commitments to developing the EAS as a forum to further mutually beneficial cooperation and dialogues as well as promoting the central role of ASEAN in line with the Kuala Lumpur Declaration. They underlined the significance of navigational collaboration for effective management of relevant issues such as navigation and aviation security, connectivity and freedom, along with search and rescue work, maritime environmental protection, fishing activities, and food and energy security. They expressed their hope to promote the implementation of the EAS Statement on Enhancing Regional Maritime Cooperation adopted at the EAS-10 Summit in November 2015.